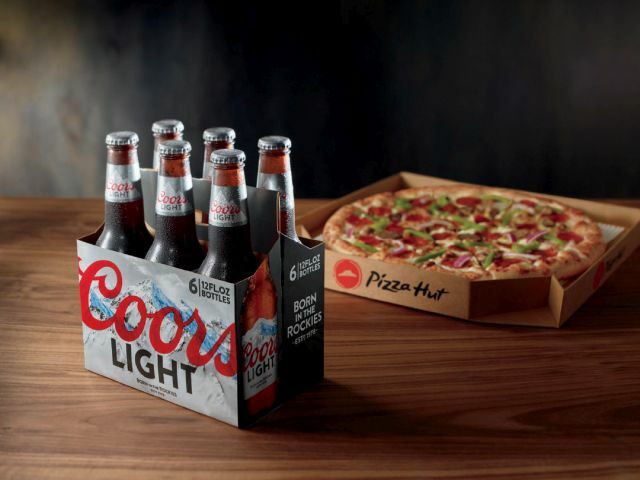 Pizza Hut expands their test of beer delivery to almost 100 restaurants in Arizona and California this month. The beer is chilled and kept cold during delivery by a custom-designed cooler so that it can immediately be enjoyed with your pizza. At participating Arizona locations, free delivery is included with the online purchase of select six-packs of beer (Coors Light, Blue Moon, or Miller High Life). In Arizona, restaurants participating in the test can be found in Phoenix, Tucson, Glendale, Prescott, Winslow, and more. In California, participating locations can be found in Los Angeles, Bakersfield, Riverside, Sacramento, Santa Barbara, Santa Clara, Anaheim, Fresno, Huntington Beach, and Redding.